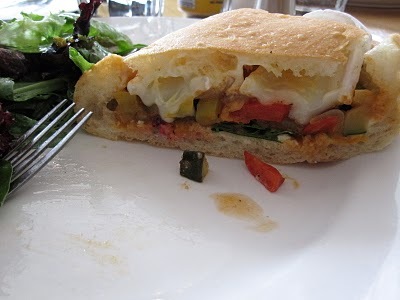 I am so excited because I just perfected the ratatouille sandwich from Toronto! As promised, here’s the recipe. This recipe is great because it is so multi-purpose. I made the ratatouille last night to have as a side with the most amazing ribs, which left most of ratatouille for these sandwiches the next day. Choose a soft bread with lots of flavor, and use a good mustard. This is a great dinner on a weeknight, after a walk. In a large, deep skillet, heat 2 tablespoons of the olive oil. Add the eggplant, 2 of the thyme sprigs, one-fourth of the minced garlic and 1/4 teaspoon of the crushed red pepper; season with salt and black pepper. Cook the eggplant over moderate heat, stirring occasionally, until tender, about 7 minutes. Scrape the eggplant into a large bowl and discard the thyme sprigs. Repeat with the zucchini, red bell peppers and onion, cooking each vegetable separately in 2 tablespoons of oil with 2 thyme sprigs, one-fourth of the minced garlic and 1/4 teaspoon of the crushed red pepper until tender. Each vegetable will take varying amounts of time to cook – keep in mind that this sauté is when they’ll get most of their cooking, so sauté until your happy with the texture. For example, the peppers take just a few minutes but the onions will take closer to 15 minutes. Add the cooked vegetables to the eggplant. Return all of the vegetables to the skillet. Add the tomatoes, basil and parsley and simmer over moderate heat until the tomatoes are softened, about 10 minutes. Split the rolls by cutting around the top and pulling out the top – like you’re making a well in the bread to contain the filling. On a large baking sheet, toast the rolls under the broiler, until crusty. 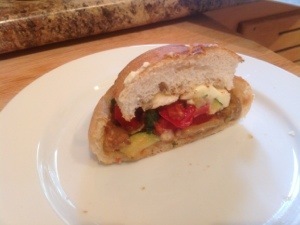 Fill the warm rolls with the ratatouille, and top with the sliced brie. Spread the top of the roll with Dijon mustard – serve right away. 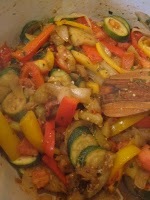 Adapted from Food & Wine, http://www.foodandwine.com/recipes/ratatouille-and-goat-cheese-subs, accessed on August 14, 2010. * I wish this was a photo of my sandwiches tonight, but – though they were delicious – they were ugly. Really ugly. But delicious. Update: 4/14/13. I made this again for the first time since this post, and I wish I had not waited so long. This is a very simple and super flavorful dish. Here’s the sandwich I made.